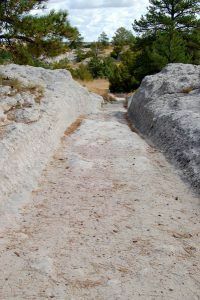 Just south of Guernsey, Wyoming are the Guernsey Ruts. Also known as Deep Rut Hill, history left a definite mark here, as thousands of wagons bound for the west on the Oregon Trail carved deep ruts into the sandstone. The Oregon Trail became one of the key migration routes that pioneers crossed on their way to the vast west. Spanning over half the continent the trail proceeded over 2,170 miles west through territories that would later become Missouri, Kansas, Nebraska, Wyoming, Idaho, and Oregon. The long journey through endless plains, rolling hills, and mountain passes, began in Independence, Missouri and ended at the Columbia River in Oregon. In its more than 25 years of regular use, the trail carried an estimated 300,000 emigrants to the vast west, a trip that took about five months to complete. Today, visual remnants of the old trail can still be seen across the west, but none that are as distinct as those found near Guernsey. 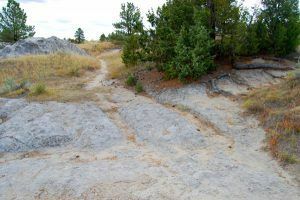 Here, the trail was forced away from the North Platte River and crossed a ridge of soft sandstone where gouges as deep as five feet deep were carved into solid rock. These heavy ruts resulted from years of wagon wear and from intentional cutting by emigrants attempting to ease the steep passage up from the level river bottom to the High Plains. The site, declared a National Historic Landmark in 1966, is part of Guernsey State Park. Guernsey State Park is also home to several beautiful examples of historic Civilian Conservation Corps (CCC) architecture. These structures, made of stone, iron, and hand-hewn logs, were built during the 1930’s as part of President Franklin Delano Roosevelt’s efforts to alleviate skyrocketing unemployment rates and preserve America’s natural resources. Guernsey was the first cooperative venture between the Bureau of Reclamation, the National Park Service, and the Civilian Conservation Corp to develop a public recreation area. Based on the success of this agreement Guernsey became a prototype for developing recreational facilities at Bureau of Reclamation reservoirs. Here, the CCC proved that with sufficient training and supervision the laborers were capable of constructing high quality and enduring examples of architecture and here is where some of the most important National Park Service park planners of the Depression Era honed their trade. The basis of Rustic architecture was simplicity in design, use of native building materials, avoidance of overly perfect construction lines, and a general feeling of having been built by pioneer craftsmen. While these buildings may sometimes appear crudely built, they are often excellent examples of design and craftsmanship. 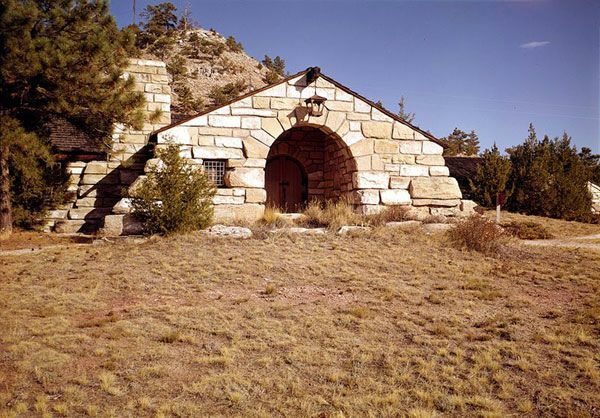 The Sitting Bull picnic shelter is a superb example of Rustic architecture, it is difficult to tell where the ground stops and this building begins as it rises out of the rock landscape. The Castle may be the most elaborate picnic shelter in the country. The historical portions of the park have been left unmodified since they were constructed in the 1930s. Nowhere is this more evident than at the park museum. The museum building and displays are essentially intact to 1937. CCC projects also included hiking trails, roads, bridges, and even a nine-hole golf course, which was abandoned in the early 1940’s. This would eventually lead to some of the most massive and popular facilities in the National Park Service. For this and several other reasons, Guernsey State Park was designated a National Historic Landmark, separately from the ruts, in 1997. In addition to the historic district, the park contains Guernsey Reservoir on the North Platte River and a museum that includes exhibits about the Civilian Conservation Corps and the natural and cultural history of the park. It also provides seven campgrounds and an extensive network of trails. The park is located just ½ mile south of the town of Guernsey, off Highway 26. Just two miles southeast of the town of Guernsey is another Oregon Trail historic site called Register Cliff, where hundreds of pioneers inscribed their names.